With university fees on the increase, young people are considering the costs and benefits more than ever and more middle-class teenagers are opting for the apprenticeship route as an equally valid option. 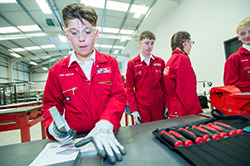 Engineering solutions firm adi Group currently has 14 students enrolled on its post-16 apprenticeship scheme and a dozen 14-16 year olds undertaking an adi pre-apprenticeship in partnership with a local school, which the company says is the first programme of its kind in the UK. He continued: “As a result, more young people are seriously considering apprenticeships, however, more needs to be done to meet this demand for work-based learning with real value. adi Group’s pre-apprenticeship scheme launched last September and involves 12 secondary school students – male and female – attending adi Group’s workshop for half a day each week. The two-year course, with a second group of 12 students joining later this year, runs for 32 weeks for the first year followed by a further 26 weeks the following year. This will occupy 10% of the students’ overall curriculum time as they continue to work on their GCSEs alongside the course. It provides a stepping stone to a full-time apprenticeship.